Let me begin by acknowledging that we are gathered on the traditional territory of the signatories of treaty 7 where the Metis people of Alberta have a deep connection with the land. Thank you so much, Bryan, Craig, Joel and UA Local 496 for having us here today. I’m so looking forward to getting a better look at the work you do here and getting a bit of a demonstration. I said we were going to build a pipeline... I’ll do it myself if need be! 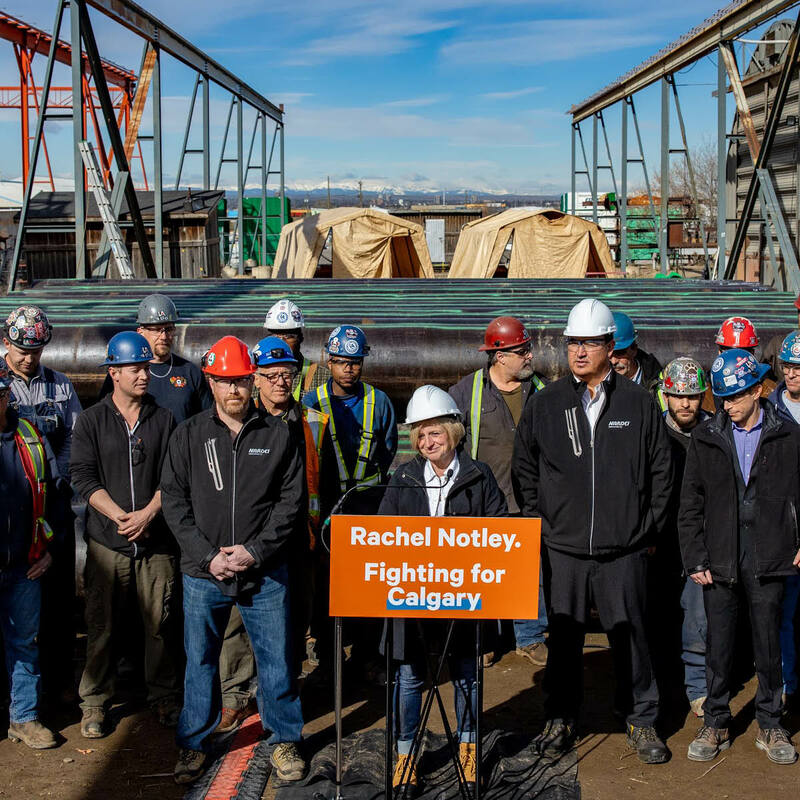 But seriously, thank you for the work you all do to build our economy, for Calgary, for Alberta and for Canada. Nardei’s been building pipe in Alberta since 1963. And we’re here today to talk about the way forward. At the start of this campaign, I asked – who do you trust to fight for you? Me, or Mr. Kenney. Do we move forward with his plan – or mine? As we come to closing hours of this campaign, the choice could not be clearer. My plan diversifies the economy. Mr. Kenney’s plan doesn’t. My Made-in-Alberta plan for economic diversification will mean that our future is built right here in Alberta. We have the biggest energy upgrading plan since the days of Premier Peter Lougheed. Seventy-five billion dollars in private sector investment and 70,000 jobs turning our energy into the products the world needs. And we will win the fight to build a pipeline. It’s been the fight of my life. It’s been the fight of our lives. I want to say thank you to the people of Calgary for their support. When I travel the country talking to Canadians about the need for pipelines, I know you have had my back. As I will always have yours. Through patient and determined action we have built a durable national consensus on the need for pipelines. A strong and growing majority of Canadians support Alberta on pipelines, including in British Columbia. I intend to keep it that way. I know Albertans are concerned about the economy and about their futures. The oil price collapse hit us hard. It’s been tough on so many people. And so, I make this promise to all Calgarians: I will fight for you. I will move our oil by rail, so we can get a better price for our resources. I will keep diversifying our economy, investing in upgrading and refining right here at home. And I will win the pipeline fight. Not by shouting at our fellow Canadians, but by continuing to build support. We expect a positive decision next month. And when the pipeline is built it will stand as a testament to a province that stood united. A province that did what it took to get the job done. Just like these workers do every day. Friends, I must say that Mr. Kenney’s plan on the pipeline worries me. And I think it should worry everyone. Some of the rhetoric we are hearing from him puts the pipeline at risk. And his plan to cancel the rail deal to move oil by rail will send the wrong signal to investors around the world. Friends, the bottom line is this. On Trans-Mountain, we are this close. We have come this far through patient, determined and strategic action. But Mr. Kenney is prepared to mess it all up so that he can make headlines. It’s risky. It’s wrong for Alberta. It’s wrong for our economy and jobs. And it’s wrong for our future. And if all that weren’t bad enough, Mr. Kenney and his leadership campaign are under RCMP investigation for alleged voter fraud. Now you tell me. Would you be able to dedicate yourself to the fight for pipelines while your leadership was under investigation? I don’t think so. And so, as voters consider their decision tomorrow, I ask again: who do you trust to fight for you? Do we keep fighting for jobs, economic diversification and a pipeline that will have shovels in the ground this fall? Or do we put that all at risk with Jason Kenney? And I have a message for people who are looking at the choice. If you voted PC in the past, or are thinking of supporting the Liberal or Alberta Party but have concerns about Mr. Kenney and the choices he will make… How he’ll put the pipeline at risk. If you have concerns about the fact his campaign is being investigated by the RCMP then I appeal to you directly to join us. You may not agree with everything I have done. But we share core values and want a government that looks to where the puck is going, not to where it once was. A government that knows Alberta can either lead, or get left behind. If we stick together, we will build the pipeline and we can build a strong economy that supports all Albertans.